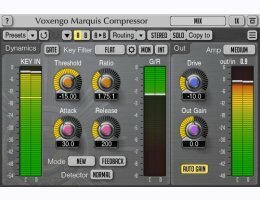 Marquis Compressor is a "universal" compressor AAX, AU and VST plugin for professional music production applications. You'll find a very smooth compression performance in this compressor, coupled with a harmonically-rich sound, both suitable for mixing and mastering. Being "universal" this compressor can be used on a wide range of sound material: individual tracks, stems and mixes, producing "clean" or "colored" sound. Marquis Compressor features a unique "round" signal level detection algorithm, which creates a very open, punchy, compressed sound with an impressive transient response. Beside this, Marquis Compressor offers a classic feedback (opto) compression mode switchable to a more common feed-forward compression. This plugin is compatible with Windows (32- and 64-bit Windows XP, Vista, 7, 8, 10 and later versions) and Mac OS X (10.6 and later versions, 32- and 64-bit, Intel processor-based) computers (2 GHz dual-core or faster processor with at least 2 GB of system RAM required). A separate binary distribution file is available for each target computer platform for each audio plugin specification. Compatible Windows and Mac OS X software: Cubase, Logic Pro, Ableton Live, ProTools, Reaper, Cakewalk Sonar, Presonus Studio One, Nuendo, WaveLab, GarageBand, FL Studio, Sony Vegas, SoundForge, Adobe Audition, Samplitude, Digital Performer, Mixcraft, Bitwig Studio, Edius, others. Get your Marquis Compressor plug-in demo here!